This was the very first brush I wanted to work on, the most exciting, finding the perfect combination of density/softness/material was so important and this is a brush I was truly missing on a daily basis. With this exact density: it follows the features perfectly, all the bristles work together pressing and blending the product evenly on the skin, it will neither feel stiff nor floppy. This exact size: to allow fast application without feeling too big to handle or too small for the job. This exact softness: the bristles are perfect for buffing, they feel incredibly soft but still have a huge lot of grip on the product and strength with the application. It can be used with both loose or pressed powders, with sheer bronzers or other healthy/glowy finishing powders, it’s the ideal brush if you are just aiming for a quick airbrushed application of anything powder, or to polish off the final application. 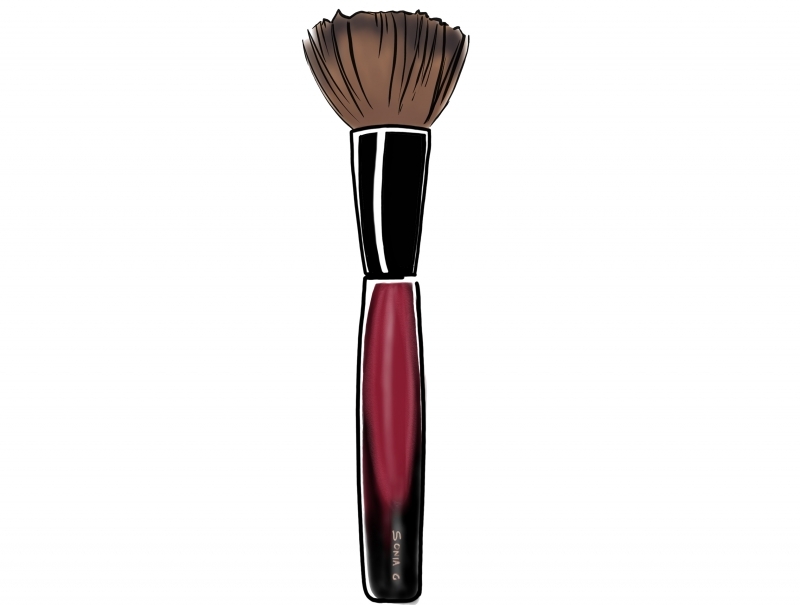 Swirl the brush onto the product, tap excess off, apply and buff in circular movements. I was waiting for your brush to use with mineral powder foundations! I have a question about cleaning your natural hair brushes, please. So far I have your eye brushes, so after a use I wipe them clean on a microfiber cloth. Please correct me if this is not wise to do. With your Face One brush, what is the best way to clean it both after each use and over the long term? Is it true that with these natural hair brushes, soap and water cleaning is recommended only twice each year; is this advised for both squirrel and goat hairs? THANK YOU, SONIA! For sure it’s not good to clean after each use if the brushes are only for yourself, washing them too often is going to shorten their life span, however… twice a year it’s certainly not enough. The manufactures don’t recommend to wash them too often and I heard some say every 3 or so months but that is totally depending on the brush, on the usage. For example a mineral foundation brush will require a more frequent cleansing because you apply the foundation right after the moisturizer, etc, the oils and residues will gather more on it if you compare to a blush brush where you are most likely going to use it once you already set your foundation. It’s on a per case, you will see the bristles – even with spot cleaning- at some point they aren’t as efficient and you feel it’s time for a “bath”… I wash my mineral foundation brush every two weeks depending on the usage, my liquid foundation every weekend. You’ll see how it goes and the condition of the brush. Also a foundation brush is really going to be very closely in contact with your pores, not cleaning it often can be causing issues with more sensitive skin to bacteria. Sometimes I don’t have time to clean them on a regular basis and I never experienced issues but it’s good to know. Some people don’t even know a brush can be washed and this is really important. A goat brush will absorb more skin oils that’s why it’s better to wash them more regularly. A squirrel hair brush should not be used on a “too-emolient” or oily skin -so they say- but we all do and it’s ok, a brush is a brush, all have a life-span and it’s so variable… as long as they are washed and dried with care we will preserve them the best, we really have to enjoy them the way we love. Hi Sonia may I ask which of your brushes you’d recommend for Guerlain Meteorites? Is it the Face One? Thank you. I use the Face One because I actually apply my Meteorites on a wide part of the face, the ones I use daily are not disco-ball like. The Face One allows to pack more product and give it a polished effect on the skin without moving your foundation around, so don’t be afraid about that. Face Two is smaller, more directional and less dense so if you are going for a more precise placement on the cheekbones, this is very good. Both brushes are flat or flatish -Face Two is a bit more domed- so with Meteorites this is perfect. Otherwise, I have some Meteorites that I am going for a very precise placemen almost linear (they have more shimmer), then I use the Sculpt Two, with this one you can achieve a more chiseled placement, I use either pat or buffing side-to-side movement to apply. I hope this helps you? Thank you very much for your answer. It’s very helpful. I may just have to get both a Face One and Two. This brush will provide medium to full coverage but the bristles have some flexibility and follow easily the face features, they don’t feel like a mass on the skin and won’t move the product around, it won’t disturb the foundation application underneath. The coverage also depends on the products, if the product has a hard pan you will be able to pick enough product and build the application. I won’t recommend this brush for a powdery dark bronzer for example but I will recommend it for finishing powders, powder foundation and to even out and polish the final application. hope this helps! I have been waiting for the face one brush to come back in stock. However, I just read your response to someone about using it with the meteorites, which meteorites do you use that aren,t “disco balls”. I plan on using this brush for finishing powder/meteorites but am waiting to buy tillI I get your brush and since our coloring seems similar just curious as to which ones you use. And of course, any anticipated date of it being restocked? Also, someone gave me the StylPro brush cleaner set with their solution. Can I use this to wash your brushes with ? Both dyed and undyed? I have many of your brushes including your last pro eye set and love them all!